Scroll down to see our list of crushed rock with pictures!! How Much Gravel Can I Get? We have no minimum required on these products for delivery. You can get quoted for 1 yard and on up to a hundred yards though the more you get the better the pricing will be. We can haul up to 12 yards in one load in our bigger trucks. If weight of the larger trucks are a concern or access to property too small for the bigger trucks we have a 6 yard truck that can be used. The 6 yard truck can be used to haul multiple loads but you will not get the same price as if hauling with the bigger trucks. We Can Install Your Rock Product Too!! Need the gravel put in place? We install walk ways, driveways and even drainage systems of all type. In most cases our trucks can spread the gravel for you free of charge on your driveway, as long as you don't have overhead wires and tree limbs that would interfere. Want to do it yourself? That's ok. You can still have it delivered and at a great price. We have carefully selected only the best sources for gravel so that we are sure you will get the best. Why? Because we do landscape installations are self and we want the repeat business that you only get when using products that really work. Just read through the list of gravel products we offer below. For more information on our installations check out our service page. Deliveries to all Seattle areas and Eastside as in Mercer Island, Bellevue, Kirkland, Redmond, Sammamish Plateau, Issaquah, New Castle, Renton, Maple Valley, Kent, Burien, Sumner and more. If you don't see your city listed we still probably deliver to it. Email or call to find out. One yard of 5/8th crushed rock or any fine crushed product will cover 108 square feet 3 inches in depth. Is the gravel for your walkways or driveways? 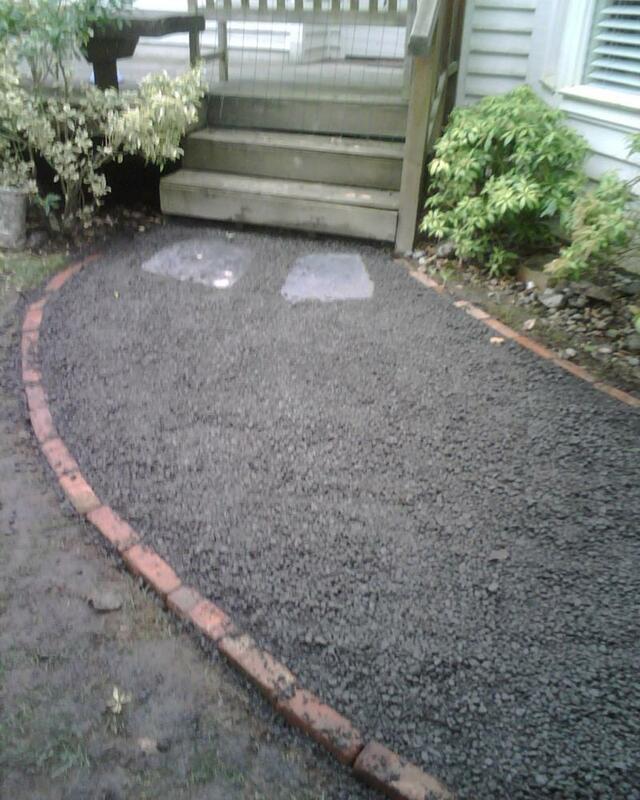 Most common type of gravel used for walkways and driveways would be the standard gray 5/8th minus crushed rock. But if you want something different then check out gravels we have listed on this page. The least expensive of the colored rock would be the dark gray crushed basalt. The dark gray is the most popular too. If you are looking for red gravel the least expensive would be the Red Cinders. The most popular colored rock for flower beds is the lava rock. If looking for decorative rock for drainage we have large cobble rock. You will see this listed within the page for drain rock . We also offer some colored cobble rock as well but you will need to call or email to see what is available as stock always changes. Need Weed Block for under the gravel path your about to put in? Or for your drainage projects? We have that too. Maybe a tarp to dump your load gravel on? Check it out in our Tools & Gardening Supplies page. Have it delivered with your order. This rock is just under an inch in size and smaller and has fracture broken edges. If the rock source for this product is from an old Coal Mine in Black Diamond. Years ago a fire burned underground through some of the veins of coal and baked the rock and clay making the Red Cinders rock. This rock is just under an inch in size and does not have smaller broken pieces in it. This rock is not from a local quarry so it will be considerably more expensive then local rock products. This rock is about 3/8th inch diameter on average. Close to size of local pea gravel drain rock. A fun sand that is often used in miniature settings and planting beds with ornamental grasses. This is a nice darker color that looks like asphalt when wet. It will have more fines in it then the regular or standard glacial till that is so common but this stuff packs almost as hard as concrete. We have a lot of satisfied customers with this one. The color will vary from time to time on how dark this rock is but it usually is on the darker side then not. It will appear lighter when its hot and dry out. This rock tends to be more expensive then the regular 5/8th. Picture not available at this time. This is a type of quartzite and has white pieces mixed with dark gray to black pieces. This rock is not from local quarrys and it will be more expensive then local rock products. This is a popular rock for water features, landscapes using grasses and other landscape projects. This rock has also been used for planting beds and pathways. Colors are more visable when wet. This is popular for pathways. This may be to big for pathways but it has been used for water features as well as other landscape projects. Color is more visable when wet. Great for pathways and other landscape projects. This rock is great for pathways and other landscape projects. Popular for pathways, gravel drives and other landscape projects. This rock is available with fines but only for a limited time as there is only approx 10 yards left as of July 2011. Want A Price On Rock? For information on what we need for you to schedule a delivery go to Place An Order. We like inquiries and orders done by email ibark4u@aol.com but if you need to talk to someone in person call 425 271-7645. For addition information on how to reach us go to our Contact Us page.